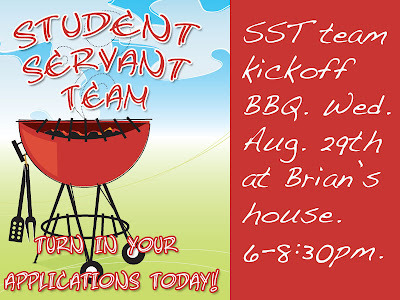 This wed. night from 6 to 8:30 at Brian's house is the student servant team school year kick off. We have 4 teams: a production team (weekend sent and program), a praise (read music) team, a tech team (read sound and lighting and videos), and a people team (greeters and cafe). If your student wants to get involved, they should have already gotten an application from us. If not, they can pick one up and you can e-mail Brian @ brian@journeycom.org for directions to his house. Students who have already turned in an application should already have the information e-mailed to them by Tuesday.